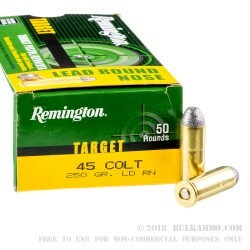 Lead round nosed, old school fun with this relatively inexpensive brand name Remington .45 Colt ammunition. This round is all about getting back to the basics with your old guns (or your new ones that take this old cartridge). The 250 grain bullet is a classic “semi” round nose with the slight flat point on the tip. 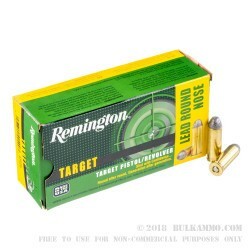 Remington utilizes their classic green and yellow box for these, and it’s fitting – Every shooter over the age of 9 remembers the feeling that box inspires. It’s simply a thread in the fabric of the tapestry of the American shooter. 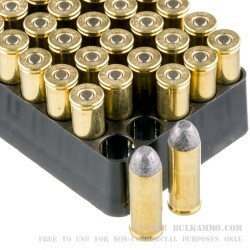 As traditional and credible as Remington is, this .45 Colt cartridge is equally credible and has a similar history. It’s been the last thing to touch many large game animals alive. It’s been the source of meals for many families throughout the years. It has provided enjoyment in the single action armies that enthusiasts shoot regularly, as much as it provided the law keeping in Westward expansion for over a hundred years. This is not a normal run of the mill cartridge - it has stories to tell. 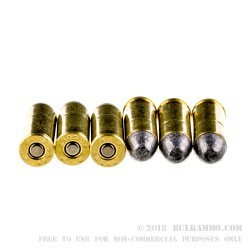 Suitable for use in any modern .45 Long Colt firearm.